BBQ Chicken Tater Tot Skillet: delicious comfort food to the max! 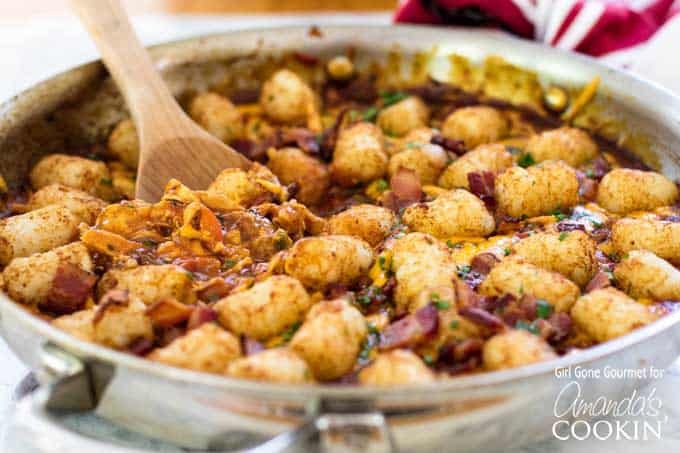 A twist on a traditional Midwestern tater tot hot dish, this BBQ Chicken Tater Tot Skillet goes from stove to oven, to the table in just one pan. All the favorites are here – toasty tater tots, crispy bacon, melted cheddar cheese, and shredded BBQ chicken. And, if you’re like me, you might be wondering: where has this been all my life? 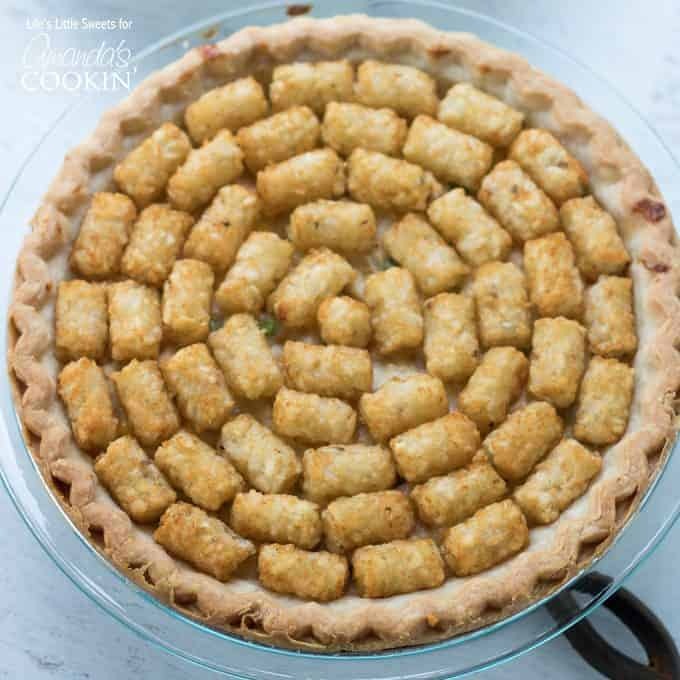 Despite growing up smack-dab in the middle of the country in the great state of Wyoming, my childhood was devoid of a Midwestern classic: tater tot hot dish. Maybe our small-town 1980s grocery store didn’t carry frozen tater tots? Or maybe it’s a geographic issue – Wyoming is not technically part of the Midwest. Perhaps an invisible barrier prevented the migration of this classic out of its state of origin. Or maybe my mom had a sneaky suspicion that if she made a casserole topped with tater tots we’d never want anything else for dinner. I mean, come on, it has tater tots! So it wasn’t until a few years ago that I discovered this culinary treasure on Pinterest and I have spent, what now seems like an excessive amount of time, wondering how I could live all these years without this comfort food BBQ chicken tater tot skillet in my life. Up until now, tater tots had always stood independently on my dinner plate with ketchup as their only accessory. The idea that they could be part of the main dish, adorning the top with their potato goodness, well, that was just too good to pass up. RELATED: Want more easy skillet dinners? Check out my 30-Minute One Pan Beef Penne, Skillet Chicken Lasagna, and Easy Skillet Chicken Parmesan. 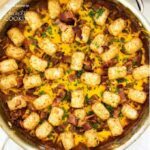 For this BBQ chicken tater tot skillet, I took the basics of a tater tot hot dish and switched things up a bit. First, I used an oven safe 10-inch skillet instead of a casserole dish to make clean-up easier. The whole dish comes together in the one skillet. Second, traditional tater tot hot dishes often have ground beef in some kind of savory sauce or gravy. I used chicken instead and cooked it first in some bacon fat before shredding it. From there the BBQ theme took shape with bell pepper, poblano pepper, and store-bought BBQ sauce. Bacon. Preferably thick-cut bacon. I used boneless skinless chicken breasts, which have very little fat, so a little bacon fat goes a long way in adding smoky, rich flavor to the dish. Onion, garlic and bell pepper (I used red, but substitute your favorite color if you wish). Poblano pepper adds a little heat without making it spicy, but jalapeno pepper would work well if you like the spicy dialed up. As the bacon, chicken and vegetables cook they leave behind browned bits that collect on the bottom of the pan. Add chicken stock to the hot pan and scrape up all those browned bits, also known as delicious flavor. 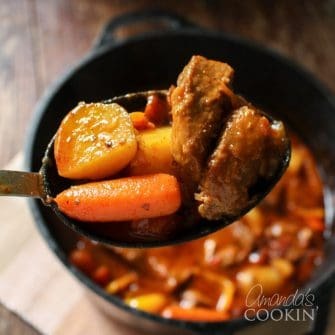 A little flour helps thicken the sauce, though cornstarch is also an option. BBQ sauce. I used a basic store-bought sauce, but any tomato-based BBQ sauce will work well for this recipe. Use your favorite or if you have a super secret family BBQ sauce recipe feel free to use it. And send me the recipe, please. I promise not to share it. I don’t often pull the soap box out, but when it comes to cheese I can’t help but get up on it and share a strong opinion. Please shred your own cheddar cheese! Pre-shredded cheddar cheese doesn’t melt well, so buying a block of cheese and shredding it yourself will make a big difference. I use my food processor to make easy work of shredding cheese and then bag it and keep the extra in the fridge. 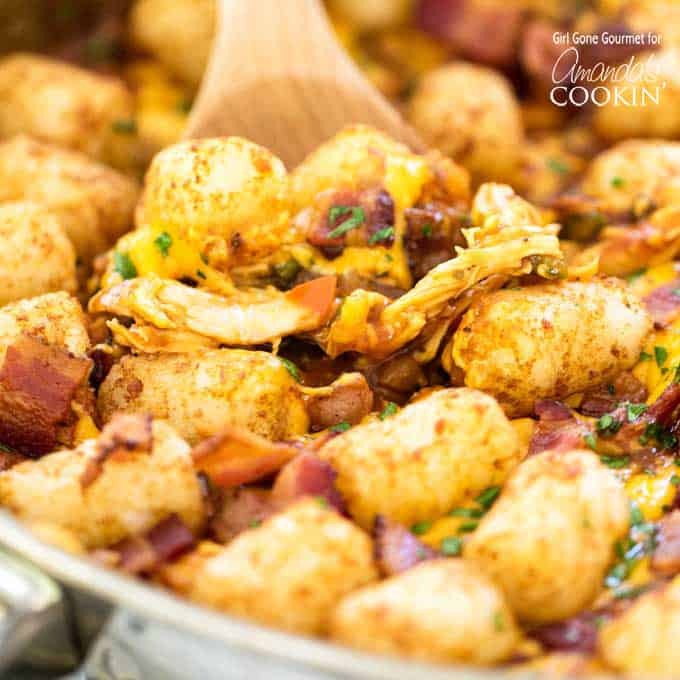 This BBQ chicken tater tot skillet with all its melted cheese, crispy bacon, and tater tot goodness might just be a gateway dinner to more wonderful and comforting tater tot dishes. Because, at least in my book, if its got tots it must be good. Similar in deliciousness is our Chicken Pot Pie Tater Tot Casserole. This chicken pot pie tater tot casserole has chicken, pie crust, tater tots, and mixed vegetables all combined into one tasty dish! We have a couple more easy weeknight skillet dinners you may be interested in, like this ever-popular Bacon Cheeseburger Pasta, the famous John Wayne Casserole, this One-Skillet Chicken Broccoli and Rice, this delicious Skillet Broiled Cod, or these Rotisserie Chicken Nachos. Enjoy! A twist on a traditional Midwestern tater tot hot dish, this BBQ Chicken Tater Tot Skillet goes from stove to oven, to the table in just one pan. Prepare the chicken breasts: Place the chicken breasts on a cutting board and cover with plastic wrap. Pound the chicken with a meat mallet until each piece is of even thickness, about 1 - 1 1/2 inch thick. Season both sides of the chicken with salt and pepper (a few pinches of each). Cook the bacon over medium heat until crispy. Remove the bacon, reserving the fat, and transfer to a plate lined with paper towels. Drain off some of the fat, leaving about 1 tablespoon in the pan. Add the chicken breasts to the pan and cook through, about 8-10 minutes. Remove the chicken from the pan and set aside. Add the onion, garlic, and peppers to the pan. Cook them until the soften, about five minutes. While the veggies are cooking, shred the chicken. Add the chicken stock to the pan with the veggies and bring it to a boil. Scrape all the browned bits off the bottom of the pan. Add the oregano and salt and stir. Sprinkle the flour over the top of the veggies and stir until the mixture thickens. Add the shredded chicken to the pan and stir it all to combine. Add the BBQ sauce to the pan and stir to combine. Turn the heat off and top the BBQ chicken with the shredded cheese. 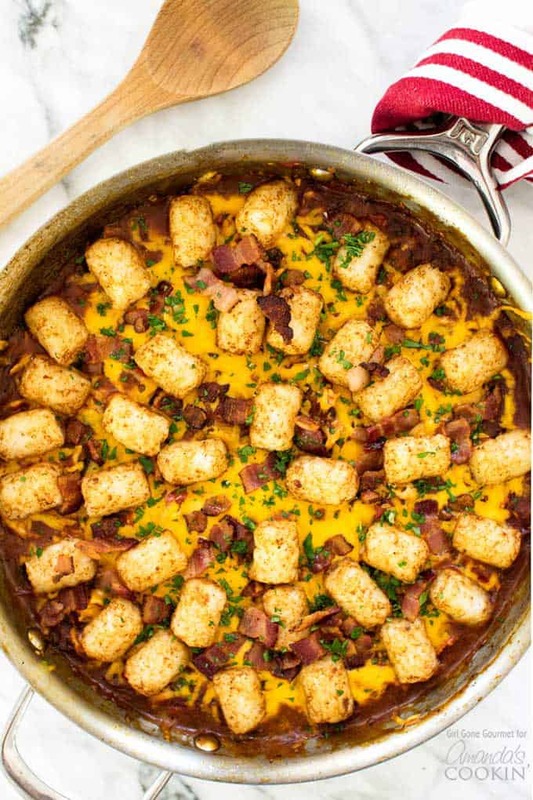 Top the cheese with the frozen tater tots. Sprinkle the crispy bacon over the top. Transfer the skillet to the oven and bake for 20-25 minutes, or until the dish is bubbling and the tater tots are hot and baked through. Garnish with chopped parsley before serving.